The first five years of your child’s life are the most important for learning as the brain develops rapidly during that time. For your 2 year old toddler, play isn’t just a game. They are exploring, problem solving and learning. At Oz Education, we provide a wide range of learning opportunities which encourage learning through play in our pre-kindy program for children aged from 2 to 3 years old, also known as the Koala group. The day is divided between indoor and outdoor play where pre-kindy children can fulfill their natural curiosity as they explore and discover the world around them. 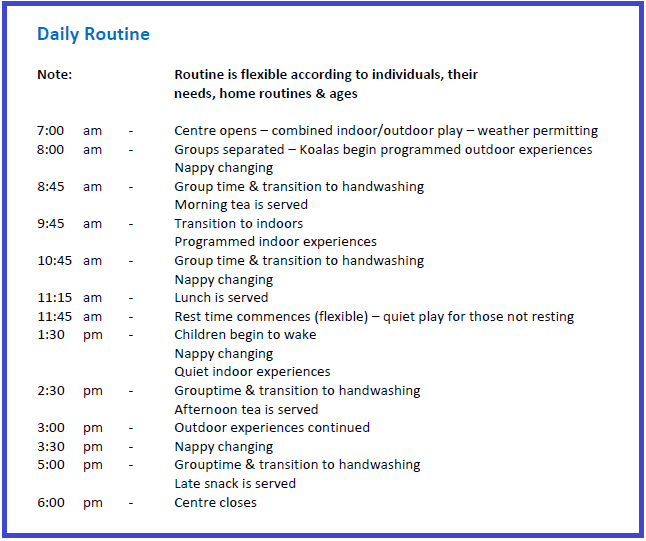 Below is a sample of the daily routine in our Pre-Kindy Koala Room which changes to suit the growth and developmental needs of each child.